...and a little cottontail wondering what the heck we were doing in his park. He looked a little scruffy! That Other Lady had a post today that showed off what she's up to with her hexies. It looks like she's really making something very cool...good thing I'm not competitive or I'd be worried.! I bet there are some amazing hexies being sewn right now! Debby is the queen of this hop...can't wait to see what she makes. What a great photo op area! Yep that poor bunny looks like he had a bad hare day, LOL! Great pictures Carol...there will be some fabulous hexies..and I bet yours will be one of them!! I am just about ready. Lovely pictures. I love hexies so I'd better go and take a look. Love your pictures Carol. Even though I missed out in signing up for the hexies I can't wait to see what everyone has made. I even made something because it was something I wanted to try. They are not as hard as I thought they would be. Very pretty photos Carol ! I look forward to drooling over everyone's projects. 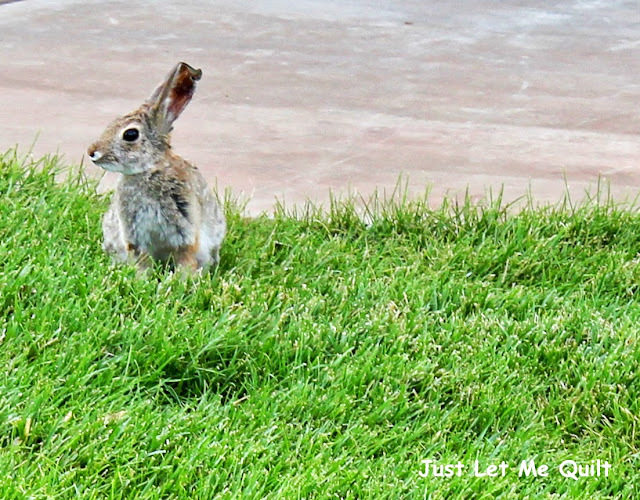 We have 4 bunnies that live in our backyard. They even leave and wonder the neighborhood. My son has a B B gun out back too. Thank goodness he knows I love those sweet bunnies. Just think-4 lucky rabbits feet! ( lucky he sill has them) Great company to enjoy the view with.